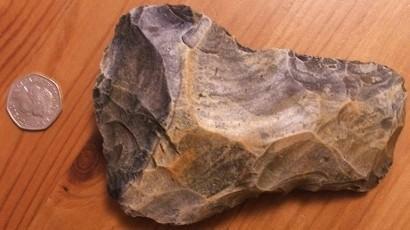 Orkney (G-B) : A Palaeolithic handaxe has been found on an Orkney beach. A Palaeolithic handaxe has been found by a local walker on an Orkney beach. Orkney-based archaeologist Caroline Wickham-Jones, who has studied the axe, described its discovery as "incredibly exciting". Ms Wickham-Jones, who a lecturer in archaeology at Aberdeen University, said: "This axe is definitely older than 100,000 years - so old it's become geology. "It was made and used an incredibly long time ago - pre-Ice Age - and whoever made it would have been familiar with animals long since extinct - the woolly mammoth, for example. “I find that really mind-blowing. "If it really comes from Orkney, it would change our understanding of the whole of Scotland. It would set back our known history from 14,000 years ago to at least 100,000 years ago. "The problem is that we cannot tell if it in fact is from Orkney or Scotland. As it was found on a beach, without anything else from that era, there are several options on how it got here. “As Britain wasn't an island at that time - nor were the Orkneys - and the conditions in Scotland were much the same as anywhere else, I find it very likely that people were living here. "The problem is that glaciers of the later ice-age have changed the Scottish landscape and therefore it is much harder to find any proof of their existence here than it is for instance in England, which wasn't covered in ice. "I don't think the axe is made on the islands as there is not enough flint here to produce such a big block of stone. But it would be possible that they had taken with them from somewhere else, or traded it with other people. “That would explain why it was reworked after it was broken. "I fear we're never going to be able to give the definite answer to this question, but it is absolutely worth doing more research on it. Julie Gibson, County Archaeologist for Orkney, said she had never expected to find "such an incredible thing" in Orkney. She said: "As it was found by itself on a beach, we have to remain sceptical. We cannot just assume it was dropped by a local guy following a mammoth. "There is always a corner of doubt - just because we don't have any proof of Stone-Age people living here, it doesn't mean they didn't. "We're definitely going to take a careful look at the shore bank to see if we can find any proof that the axe could be made and used here." The Palaeolithic - or Old Stone Age - started about 2.6 million years ago and lasted till the end of the Pleistocene around 10,000 BCE. It is a long period of tiem in which hunter-gatherers gradually evolved from early members of the genus Homo such as Homo habilis - who used simple stone tools - into fully behaviourally and anatomically modern humans (Homo sapiens sapiens). In Britain, the earliest evidence of human activity dates from about 700,000 years ago. The earliest proof of people in Scotland dates from 14,000 years ago.